big belly and the time bandits. | everything will turn out alright. big belly and the time bandits. as promised, here are some 30 week bump pictures. i even dressed up today! you will rarely find me in a dress unless there’s a special occasion going on or it’s scorching hot outside. in today’s case, it was the latter. south central indiana is a swelteringly humid 98 degrees with a heat index of almost 110. the only article of clothing i wear less than dresses is shorts. I HATE SHORTS and pants were not an option today. plus, i’m enjoying this pre-pregnancy dress while it still (sort of) fits. as i said yesterday, this bump of mine is getting BIG. our little girl is still head down, facing my back. her feet are lodged in my ribs, which is only uncomfortable when i sleep, sit, bend over or breathe deeply. no biggie. she’s healthy. i’m healthy. travis and auggie doggie are healthy. all is well here. tomorrow travis and i are going to babies r us to take advantage of the wonderful combination that is coupons+gift cards. we also have a gift card to target that needs our attention. we’re planning to buy some of the smaller essential items that we didn’t get for our shower, such as a changing pad and cover and a few fitted crib sheets. exciting! it’s really beginning to feel like crunch time around here. i couldn’t sleep last night just thinking about everything we have left to do before sylvie’s arrival. she could be here, full term and perfectly healthy, in as little as 7 weeks. 7 WEEKS. say what?! the second trimester flew by and we’re already well into the third. what happened to all that time? riddle me that, time bandit(s)! side note: the best/worst movie ever. speaking of time, it is now dinner time. ME WANT FOOD. happy wednesday! xoxo. This entry was posted in Uncategorized and tagged 30 weeks, bump watch, time. Bookmark the permalink. 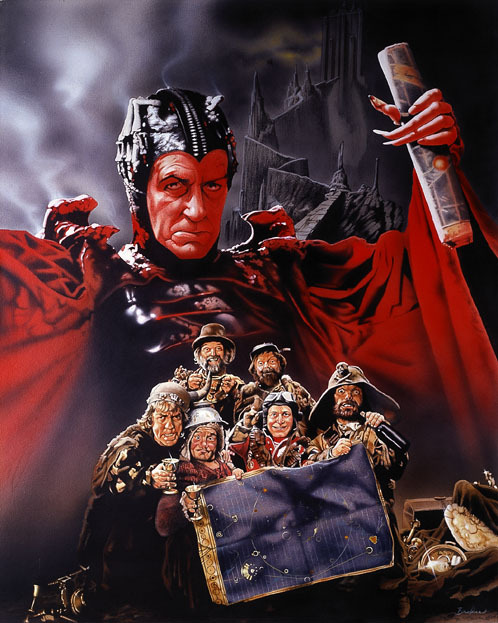 Ps I secretly love time bandits as well as Terry G.’s other quirky movies. i not-so-secretly both love and hate time bandits. so bizarre and 80s. sometimes it just hits the spot. thank you for the compliment, pretty lady! You look great! Why is your ring finger painted a different shade of blue? Or is it just me? My ring finger is a different shade of blue! I was just playing around with polish today and painted one finger on each hand a different color. If Trav and I do end up moving to Texas, I guess I’ll have to learn to love shorts. How do you get through the Texas summers without them? I live in capris and flips flops during the summer. I do wear shorts at home sometimes. Tanks are a must have here too. I wish they made capri swim suits! Ha! Capri swimsuits would be pretty funny looking! By the way, we got your package in the mail today. Travis and I love the outfit and we know Sylvie will too! Thank you so much! Awesome! I’m so glad. I just loved that crocheted vest and couldn’t pass it up. what a positively PERFECT, BEAUTIFUL baby bump! love it (and your dress and necklace too!) gorgeous photos – congrats on 30 weeks of baby bakin’! weeks 25-35 were my absolute favorites. you are such an adorable mama to be! cheers! Thanks so much! I’m really enjoying the 3rd trimester so far, too! Thanks for the compliment on the dress. My mom saw these pictures and insisted I retire it before I bust all the seams!